Proceeds will benefit our event bring awareness to childhood obesity by providing educational and social development services, aimed to improve the health & wellness of the youth and parents in our communities. Join the WE CAN'T WEIGHT™ campaign. All funds raised will go directly to LEADERSHIP EMPOWERMENT GROWTH ACHIEVEMENT COMES FROM OUR YOUTH . 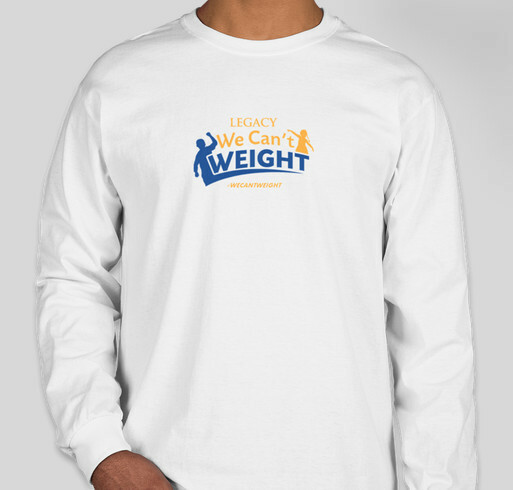 LEGACY will host the "We Can't Weight™ to Stay Fit" Event. The purpose of this event is to bring awareness to childhood obesity by providing educational and social development services, aimed to improve the health and wellness of the youth and parents in our communities. We Can't Weight™ to Stay Fit" will take place on Saturday, October 22nd, 2016 at 10 a.m. This movement will consist of a panel of experts who will discuss issues around health and wellness, obesity, and healthy choices. After the panel discussion, there will be 15-minute workouts with fitness instructors and personal trainers. LEGACY believes that in order to promote a healthier society, we must equip the youth and parents with healthier options through our resources by providing how to shop healthy, how to prepare healthy meals, healthy snacks and beverage options, the importance of staying active, tips and advice on community gardening and growing ones' own produce. We are planning for a minimum of 300 families. Each participating family will be given a sports bag containing a shirt, wrist band, water bottle, health/wellness information, contact information, and a minimum of $25 in healthy groceries. Saturday, December 3rd we will host a follow up event for the families. We will discuss their journey in making healthier choices, living a more active lifestyle, and evaluate problems that prevented them from being successful. Share Why You Support "WE CAN'T WEIGHT™ To Stay Fit"